When longtime New York landlord Tishman Speyer Properties and a partner last year agreed to buy a sprawling Manhattan apartment complex for $5.4bn, it brought attention to a sweet spot in the property market: the apartment sector. But it is not only institutional cash that is flowing into these buildings - high net worth investors are also snapping up assets. Even with rapid property price appreciation in recent years, which meant the average rental return on investment fell from 5.8 per cent in 2005 to 5.2 per cent in 2006, investing in apartment buildings is an increasingly popular choice for wealthy individuals. That's because apartment rents are set to rise between now and the end of the decade as a surge in demand from new tenants continues to outweigh the supply of apartments in some US markets. A recent survey by Marcus & Millichap, the real estate investment brokerage, found that in spite of the number of ways in which investors can enter the property investment market - such as buying shares of a real estate investment trust or pursuing property partnerships - most high net worth individuals invest by buying assets directly and rental apartment buildings are their top choice. "Sales of apartment buildings to private clients are already starting to increase compared with last year and we think the second half of the year will be pretty robust, " says Linwood Thompson, senior vice-president and managing director of Marcus & Millichap's national multi-housing group. One appealing factor for prospective investors is that buying a residential building can be more affordable than other income-generating properties, such as office or retail. Another is the positive outlook for vacancy rates and rental demand. The National Council of Real Estate Investment Fiduciaries' Apartment Index returned 17 per cent in the first three quarters of 2006, compared with an annual average of 10 per cent, while the national vacancy rate for apartments dropped to 5.4 per cent over the same period, the lowest of all US commercial real estate sectors. The rate is forecast to fall to 5.1 per cent in 2007. Strategists say there is soon going to be another surge in demand for US apartments as the children of the baby boomer generation, the so-called echo boomers, find their first jobs and rent their first apartments. This demand, coupled with the influx of immigrants who are also likely to rent, should keep the sector buoyant until the end of the decade. At the same time, the US economy has been fairly strong, job growth has been steady, yet home ownership is increasingly out of reach for many people given the appreciation in house prices. While prices have recently softened in many markets, some prospective buyers are opting to sit on the sidelines - and continue renting - in case prices fall further. "There's been a marked improvement in demand for rental apartments since 2005, " says Asieh Mansour, chief economist and strategist for RREEF Alternative Investments, part of Deutsche Bank's asset management division. "It started with the coastal markets, but now all apartment markets across the US are in a growth stage. Landlords are able to raise rents and there's steady job growth. " She adds: "I think there's another two years of positive rent momentum in the apartment sector and investors are seeing that. Unlike other sectors, we haven't seen massive overbuilding. The only areas we're concerned about are those where there are a lot of condos reverting back to apartments, such as Las Vegas, Miami and downtown San Diego. " That said, RREEF predicts returns from the NCRIEF apartment index will fall to 12-14 per cent this year because returns are comprised of income return and appreciation return. "We think that outsized appreciation return is virtually over, " says Mansour. "The only way you are going to enhance returns is if you can manage the property to boost operating performance. " While cities such as New York and San Francisco are always popular with investors, many are looking further afield to find the best rental yield. Prospective landlords with $1m-$15m to spend are now looking to the "sunbelt " states and the inland metropolitan areas that are experiencing the biggest population and job booms, such as Austin, Phoenix, Arizona, the Carolinas, Georgia, Seattle and Washington state. "There's a group of private investors that are selling property in their home markets because they've had a good appreciation run and buying in secondary or tertiary markets, " says Thompson. "So they are selling in LA and buying in Dallas, Phoenix or Austin, for example, to get a better yield. " Thompson says buyers range from private clients purchasing their first $1m-$5m investment property to help pay for their children's college fees to sophisticated family investment operations that have their own management companies and can spend about $15m on a single purchase. Many institutional funds are also partnering with local property entrepreneurs, giving them the chance to compete for $30m-plus assets. "This has been happening increasingly over the past two years and has significantly raised the minimum deal size an individual can invest in," says Steve Pumper, executive managing director of the investment services group of the national commercial real estate firm Transwestern. "Pension funds, insurance companies and Reits are all looking for development partners. Individuals can end up making 5-10 per cent on a deal in addition to development, management and leasing fees. " If you are not an expert, where are the best places to look for a property where you might find an above-average rental yield? Austin, Texas, is a good place to start. The state capital has a captive pool of renters studying at the University of Texas, as well as many employers in the high-growth technology sector. It also has the strictest zoning policy regarding new development, and thus the highest barriers to entry in Texas. The rate by which new construction is falling short of demand means that the vacancy rate, now 7.1 per cent, is likely to fall another 30 basis points in 2007. As a consequence, asking rents are this year expected to rise 3.2 per cent to $817 a month. Many institutional and private buyers have already spotted the opportunity, which has pushed up prices. "Anything in Austin will inspire a bidding war, " says Pumper. According to Marcus & Millichap's 2007 National Apartment Index - which ranks US markets based on supply and demand indicators over the next 12 months - Austin ranked 16th out of 42 apartment markets, up seven places from a year ago. While institutional investors tend to stick to the centre of metropolitan areas, private investors are looking further afield to the smaller submarkets around those centres. Thompson is a fan of San Antonio, Texas, an hour's drive from Austin, with the same high-tech jobs base, but almost no direct institutional investment. "It's an interesting market to me because it isn't overheated due to institutional interest. Plus, there's lots of development taking place down there. The apartment market there is pretty robust. " He says Augusta, Georgia, Birmingham, Alabama, Tucson, Arizona, and Nashville and Knoxville, Tennessee, are other smaller markets where he has seen private buyers do well recently. Pumper recommends looking at areas with more than one constituency of demand, such as the "research triangle " in North Carolina, which has lots of tech companies and employment growth but also a captive market of students from the region's many universities. He says to avoid areas where a surplus of condominiums on the market could revert to apartment rentals. "South Florida was overbuilt during the condo boom. People could run into problems there. " That said, Las Vegas, another market where condo development has boomed in recent years, has continued do well for apartment investors. "I know major owners that sold everything they had there three years ago because they were convinced it was going to tank, but it continues to do better than the experts say it will, " says Thompson. The resilience of the wider property market is a mixed blessing for the apartment sector, given the conventional view that it performs best when home ownership is less attractive. 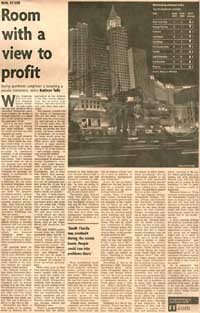 At the beginning of 2006, with the prospect of interest rate rises and spiralling house prices, investing in the sector looked particularly compelling, but with long-term interest rates still low, and house prices cooling at the beginning of 2007, is apartment investing really so appealing? Mansour thinks so. "If the economy is still growing and the demographic support is there in terms of echo boomers, you can have both an increase in demand for home ownership and apartment rental and that's what will be driving the market for the second half of the decade, " she says. A more pressing problem for would-be investors could be buying now when property prices have already appreciated so much. "Property prices are at historic highs and, as a result of that, there's been a lot of yield compression, " says Thompson. "There are people who are concerned that property prices will not be sustained, but I think the fundamental price of an apartment has been repriced over the past five years and I don't think it will revert to the norm. " He is optimistic that demand will continue to outpace supply and that rents will continue to appreciate. "I think it will take a major external shock to the market to put things off track in the next five to 10 years. " If that is the case, the hunt for the next hot market offering even better rental returns will continue.